Japan awards Maitha Al Shamsi ‘Rising Sun Medal’ … reports Asian Lite News. 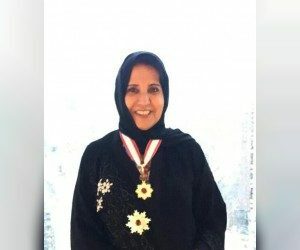 The Japanese Government awarded Dr. Maitha bint Salem Al Shamsi, UAE Minister of State, the “Rising Sun Medal of Gold and Silver Star,” in appreciation of her efforts to strengthen the bilateral relations between the UAE and Japan, including by empowering women to participate in the communities of both countries. The order is awarded in the name of the Emperor to those who have made distinguished achievements in international relations, promotion of Japanese culture, advancements in their field, development in welfare or preservation of the environment. In her statement to the Emirates News Agency, WAM, Al Shamsi thanked the UAE’s leadership for its role in her accomplishment, as well as H.H. Sheikha Fatima bint Mubarak, Chairwoman of the General Women’s Union (GWU), President of the Supreme Council for Motherhood and Childhood, and Supreme Chairwoman of the Family Development Foundation (FDF), while pointing out that the award affirms that Emirati women are capable of serving their community and other communities. “This appreciation is an honour for Emirati women and the support of the Emirati government for women in the UAE, so they can compete internationally in giving and administration. This is also due to the support of the wise leadership, the workers, and the brothers and sisters who accompanied me in enhancing the relations between the UAE and Japan, whether during my previous work in scientific research with Japanese universities, or my work in other sectors, which have elevated the stature of women in the UAE and Japan,” Al Shamsi said. She also explained that the accomplishment is a key moment, as she witnessed the regard of the Japanese Government for those who deserve their appreciation, especially those who worked for Japan while representing their countries. The honouring from Shinzō Abe, Prime Minister of Japan, with the attendance of Emperor Akihito, Emperor of Japan, for those awarded from many countries highlights the appreciation of the Japanese government and its efforts to inspire determination in those who do not have a goal in their lives, she said in conclusion.